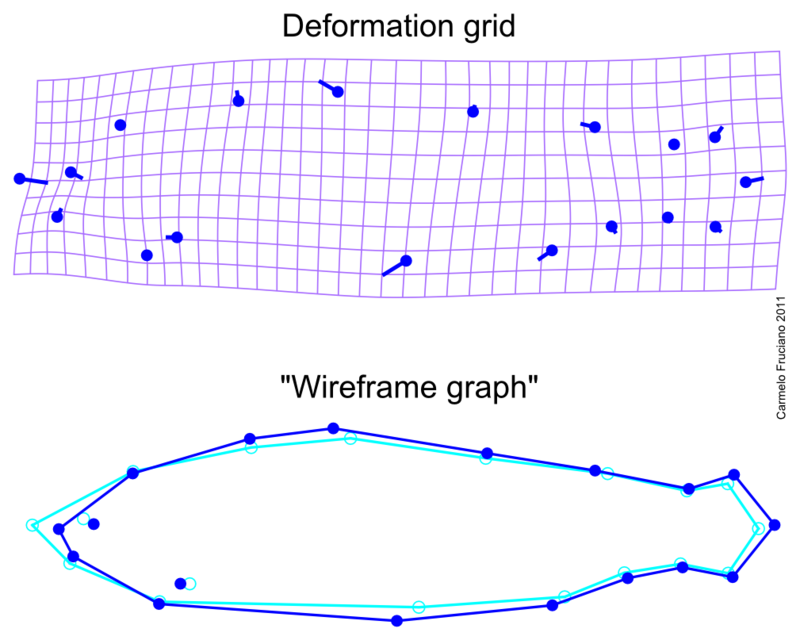 Morphometrics is the statistical analysis of shape. It is a set of techniques which are widely used in biological sciences to characterize, and quantitatively study, shapes of biological interest. Geometric morphometrics is a younger area of morphometrics and it comprises a set of techniques which, apart from allowing the statistical analysis of shape (as in "traditional morphometrics"), retain geometric properties of objects throughout the analysis. I am extremely interested both in using geometric morphometrics as a tool to answer biological questions and in exploring geometric morphometric methods themselves. Up until now, I mainly worked with geometric morphometrics to study intraspecific variation in body shape and trophic structures (pharyngeal jaws) in various fish species. When studying a biological shape, such as fish body shape, with traditional morphometrics we could take a series of linear measurements between couple of points, such as standard length (SL). From the moment we take these measurements onward, we loose all the geometric properties of the original shape and we have only a series of numbers representing distances. When using geometric morphometrics, instead, we keep the geometric information throughout the analysis. For instance, in the case of landmark-based geometric morphometrics (which is the most widely used "version" of geometric morphometrics), we acquire coordinates of points of the shape we want to analyze and carry out a series of statistical analyses on them. Given that we retained geometric properties throughout the analysis, at the end of the analyses we can visualize results as shapes, deformations of the original shapes or deformation grids. There are numerous other advantages in using geometric morphometrics versus traditional morphometrics, such as the lack, in geometric methods, of the redundancy of information present in traditional measurements; there is a wide literature on the advantages of geometric morphometrics. While landmark-based geometric morphometrics is probably the most used “version” of geometric morphometrics, there are many other methods that go under the “umbrella category” of “geometric morphometrics”. Among them, some of the most common are methods that analyze outlines by fitting mathematical functions to the coordinates of points of the outline (as in the case elliptic Fourier analysis) or by using points (called “semilandmarks”) that are not homologous but retain positional correspondence in a framework similar to the one provided by landmark-based geometric morphometrics. This page is not intended to give a comprehensive treatment of the topic of geometric morphometrics but mainly to give a few basic info that help understand why I am so excited about geometric morphometrics. For those interested, a simple literature search on Google Scholar will return many interesting papers (and books) that deal with geometric morphometric techniques more in detail than it is appropriate to do here.